Click on the name of the SSOrgs of your choice to view a list of items they often need. 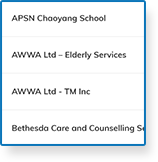 Select your SSOrgs of choice from the list of SSOrgs provided. Once done, enter your credit card details and proceed for payment.